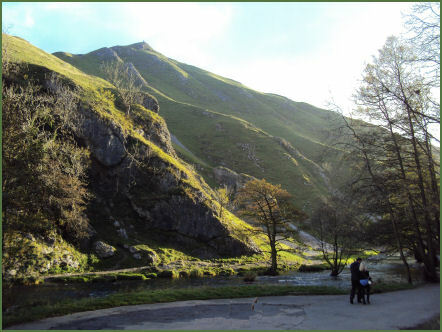 Beautiful Dovedale, a dramatic limestone ravine, with its impressive rock outcrops and tranquil woodlands is arguably the prettiest and most popular of the dales in the Peak District National Park and is owned by the National Trust. The dale is cut by the swiftly flowing River Dove and runs for just over 3 miles (5 km) between Milldale in the north and a wooded ravine near Thorpe Cloud in the south. The dale contains a set of stepping stones across the river, a scene which has graced many calendars. Soaring limestone cliffs and lofty pinnacles thrust up through the trees in a delightful wooded gorge where the footpath follows the meandering course of the River Dove accompanied by the sound of rippling water. The River Dove (from the Celtic word dubo meaning dark) rises on bleak Axe Edge Moor to the west of the spa town of Buxton and runs south for around forty five miles passing through Dovedale and its spectacular neighbouring limestone gorges at Beresford Dale and Wolfscote Dale, before joining the River Trent at Newton Solney. 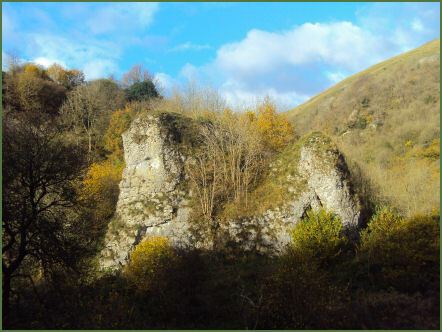 Thorpe Cloud, which rises to 942 feet, is situated at the southern end of Dovedale, (OS grid reference SK151510) between the villages of Thorpe and Ilam, an isolated limestone hill of the kind known as a reef knoll. It provides a fine viewpoint north up the dale and south across the Midlands plain. The name Cloud is a derivation of the Anglo-Saxon word "clud", meaning "hill". 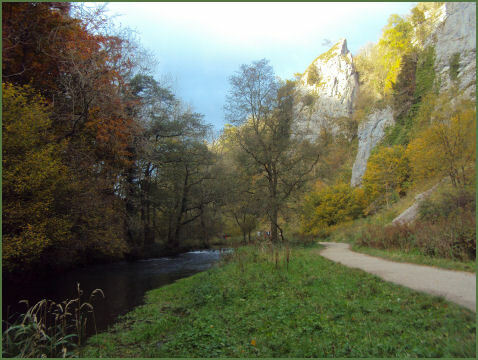 The limestone that forms Dovedale is actually the fossilised remains of sea creatures that once flourished in the shallow sea which covered area during the Carboniferous period, about 350 million years ago. During the ice ages, the limestone was cut into craggy shapes known as reef limestone by the melting ice, in some places, where the harder rock has offered greater resistance to erosion, huge crags or pinnacles have been left projecting from the sides of the valley. Many of them have been given names, Dovedale Castle, Twelve Apostles, Tissington Spires, Reynard's Cave and Ilam Rock. The much photographed Tissington Spires are almost like fins of rock thrusting upwards at the side of the gorge. The lower slopes of the spires are hidden by dense vegitation, but the tops of the pinacles rise dramatically above the wooded canopy. 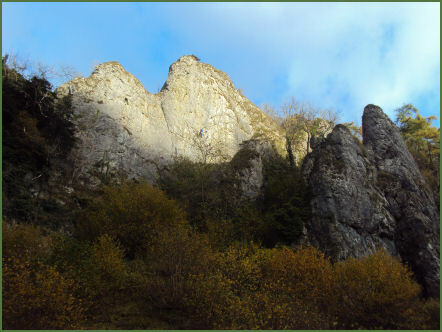 The stunning limestone outcrop of Ilam Rock is one of the finest rock pinnacles in the ravine, situated is in a dramatic setting and slender when viewed from the side, a finger pointing upwards to the sky, it rises dramatically from the banks of the River Dove. Pickering Tor stands opposite to Ilam Rock, on the Derbyshire side of the River Dove. Rock climbers are frequently seen climbing its heights with ropes. 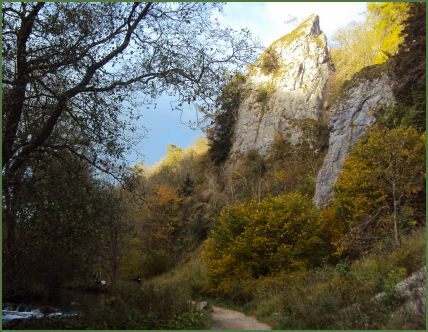 The highest point of the Dovedale path, opposite the 12 Apostles, leads to Lover's Leap , local legend relates that young, heartbroken woman jumped from the top on learning of the death of her lover, the dense undergrowth below broke her fall and she was saved. 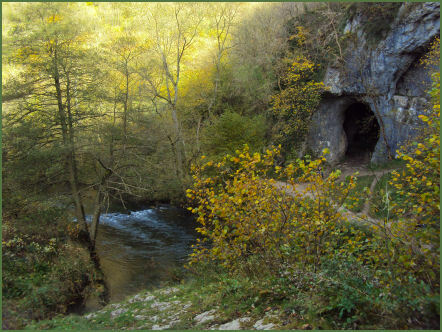 Dove Holes and Reynard's Cave, a remarkable natural arch, were formed during the ice ages. 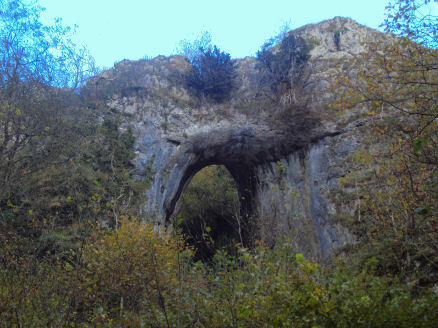 The arch of Reynard's Cave was the mouth of a huge cavern until the roof collapsed. It derives its name from Reynard , a local brigand who made the cave his refuge. These caves were first used as shelters by hunters in around 13,000 BCE, around 4,500 years ago. There is evidence from Reynard's Cave of Bronze Age activity, artifacts found there are on display at Buxton Museum. From Reynard's Cave the view of the gorge is superb. The Vikings settled in the Dovedale area around 800 AD. This settlement is reflected in local place names such as Thorpe, which are of Scandinavian origin. 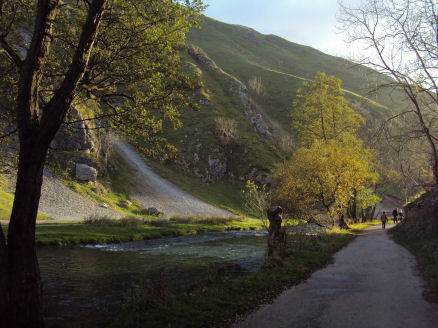 Dovedale was made famous by Izaak Walton and Charles Cotton who wrote The Compleat Angler, first published in 1653, although Walton continued to add to it for a quarter of a century after. The fishing lodge they used is still standing in neighbouring Beresford Dale, the single room stone built building is now the only relic of Cotton's era to survive intact, it is a secular shrine to all anglers. The ash woodland is comparitively recent, most of the trees are less than 150 years old. However the fascinating spires of rock had begun to disappear beneath the enroaching trees until the National Trust embarked on a clearance of them. The hamlet of Milldale, situated to the north of Dovedale, is a tranquil, riverside settlement of quaint stone cottages, set amidst steep wooded hills. The much photographed ancient packhorse bridge is the most famous of all in the Peak District, originally it had no side walls, to allow horses with panniers to clear the bridge. It is known as the Viator’s Bridge, and was made famous in the English classic ‘The Compleat Angler’ by Izaak Walton. Walton refers to himself as Viator, which is Latin for "traveller", hence the name Viator's Bridge. 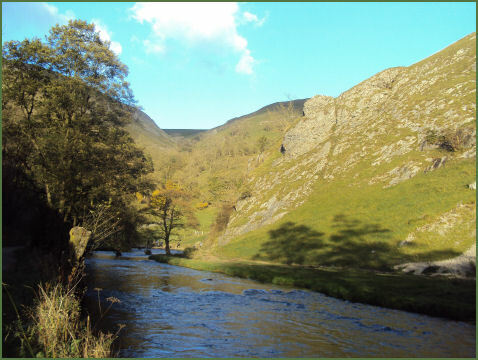 Dovedale has been cared for by the National Trust since 1934 and forms part of their South Peak Estate. Wildlife includes dippers, herons grey wagtail, goosander, moorhens, and kingfishers, water voles and hares. From Ashbourne take the A515 to Buxton, after a few miles turn left at the signpost for Ilam, Thorpe and Dovedale. After crossing the River Dove, a signposted road leads past the Izaak Walton Hotel and to the Dovedale visitor's car park. *Commencing from the main car park at Thorpe follow the path along the Staffordshire side of the River Dove. 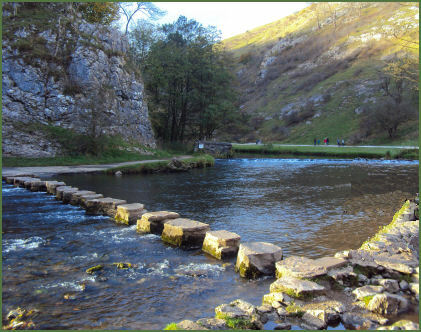 *Continue to follow the path to the reach the famous stepping stones, cross the river via the stones and continue along on the Derbyshire side of the river. *Follow the path along the side of the river until reaching the hamlet of Milldale. *Retrace your steps to return to the car park Thorpe.